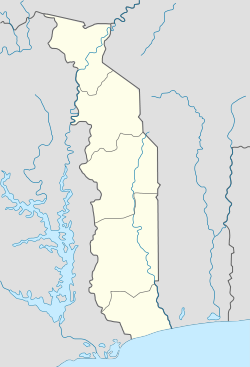 Bafilo is a city in Togo south of Kara and north of Sokode in Tchaoudjo Region. It is known for its large mosque, wagassi cheese, its weaving industry and the nearby Bafilo Falls. During World War I, a skirmish took place in Bafilo between French and German troops in on 13 August 1914. French forces first crossed the border between French Dahomey and German Togoland on 8 or 9 of August 1914. French units in north-eastern Togoland came into contact with German ones on 13 August in the districts of Sansane-Mangu and Sokode-Balfilo. After some light fighting, the French company retreated after facing resistance stronger than they had expected. Although this was technically a victory for German forces, it did little to stall the Allied advance and by the end of August the colony was surrendered to the Allies. ^ Schreckenbach 1920, p. 886. Schreckenbach, P. (1920). Der Weltbrand: illustrierte Geschichte aus großer Zeit mit zusammenhängendem text, 3: Die deutschen Kolonien vom Anfang des Krieges bis Ende des Jahres 1917. Leipzig: Weber. OCLC 643687370. This Kara Region location article is a stub. You can help Wikipedia by expanding it. This page was last edited on 23 November 2018, at 22:59 (UTC).